Thank you for joining me as we count down to the MFT release. We are four days away from the big day! All the new Stamps, Die-namics, and Stencils will be available on Tuesday, December 2 at 10:00 pm EST. Be sure to check out the MFT Blog to see all the new items being revealed today. Don't forget to leave a comment on the MFT Blog countdown posts, YOU could win one of the five $75.00 gift vouchers. The new Wavy Coloring Book Background may be my favourite background that MFT has ever released. Yes, I really love it that much! I stamped the background on a piece of X-Press It card stock and I coloured it with a few shades of pink Copics. I then die-cut the piece with the Heart STAX Die-namics. I used the fabulous Kind & Kindness Die-namics and the Kind Words stamp set for the sentiments. I LOVE this new duo of kind thoughts. Wonderful new sets. Thank you. I love the pinks used in this-ties it all together! Love how you made it into a heart and the color choices. 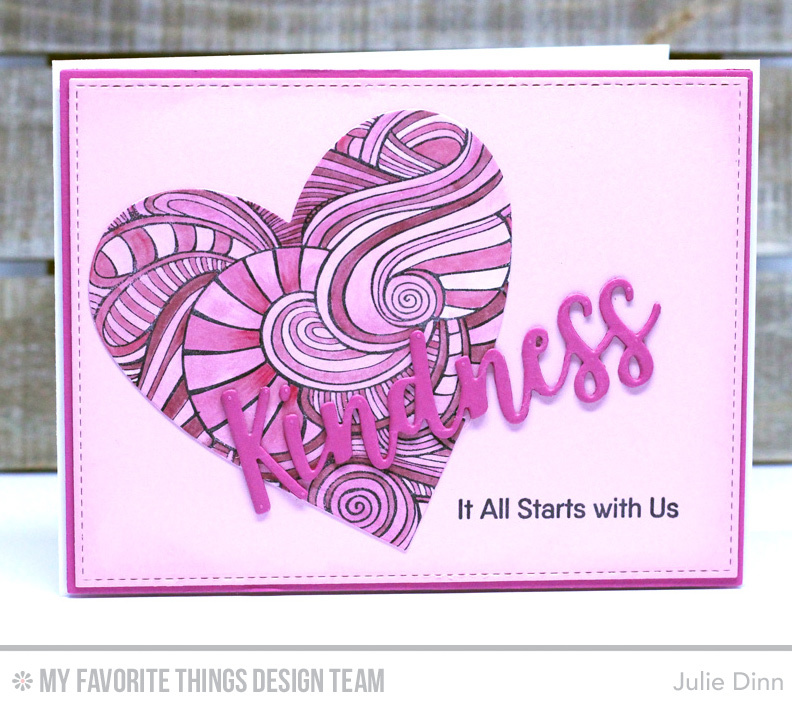 The heart makes a dramatic, beautiful use of Big Wavy Background stamp! Love your colors! The heart using the stamp is spectacular! Wow! Fabulous card from an awesome stamp! Lovely card and this new background is just Wow! This card has potential for a lot of themes. Thanks for the inspiration. Wow, I love this card!!! The colouring is beautiful and such a great way to use the wavy background stamp! One of my favourites from today's release. Thanks for the inspiration!